This morning the Herald on Sunday carried a story about Mojo Mathers trip to the Wairarapa to appear on a community radio station. Now, let me make it clear, I have no issue with this trip. It is the job of an MP to get out and interact with the community. It can be debated if there were other ways the interview could have been facilitated. But that is not the purpose of this blog. Now, this to me, implies that the story came from a source who was critical of this trip and the spending associated with it. “It’s amazing that she has so little to do with her time to actually travel to a community radio that probably has as many listeners as you can count on your hand,” director Jordan Williams said. But there is none. 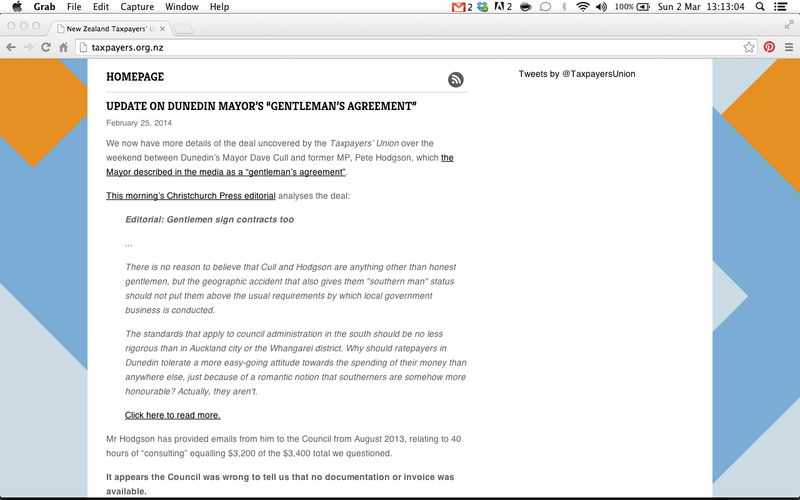 (I have included the time and date at the top of the screen grab). The same goes for their Twitter account. (again time and date included in the top of the screen). Now lets have a look at the last time Mojo’s spending was in the media. Speaker Lockwood Smith has defended a decision not to grant special funding for deaf MP Mojo Mathers’ parliamentary note-taker, saying he does not have the authority to approve it. Speaker Lockwood Smith has accused Green party MPs Mojo Mathers and Gareth Hughes of inexperience in the row over deaf technology. Smith said he was ”deeply concerned” that a meeting with officials this morning has been ”politicised” and what has been portrayed publicly ”bears no resemblance to what happened in the meeting”. So this establishes the fact that the Greens are willing to break confidentiality, and use funding and money use around Mojo’s needs as a way to score political points. Add to this the following Tweets. 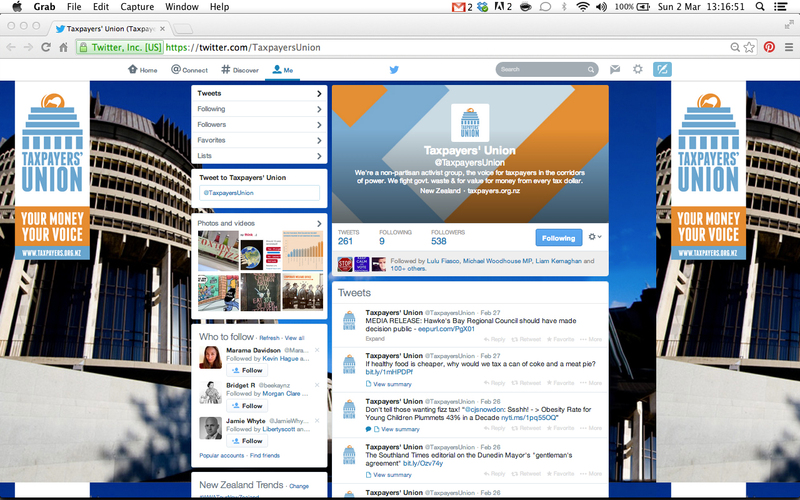 Both of these tweets appear to assume that the Taxpayers Union is the source of the story. 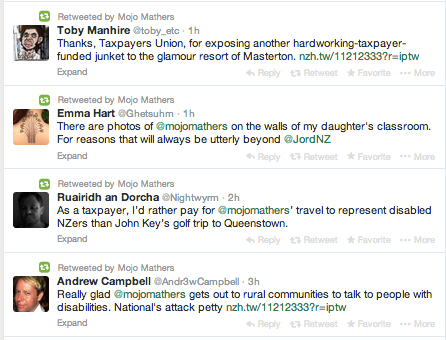 These are all retweets by Mojo. I have contact both Jordan Williams, Mojo Mathers, and Patrice Dougan asking for comment on the source of the story. Mojo has replied by email. (I have reducted my phone number at the bottom, so I don’t get bombarded with calls. But everything else as is). I have emailed and Tweeted Patrice, with no reply in over 90min. I have also contacted Andrew Campbell for comment, with no reply. 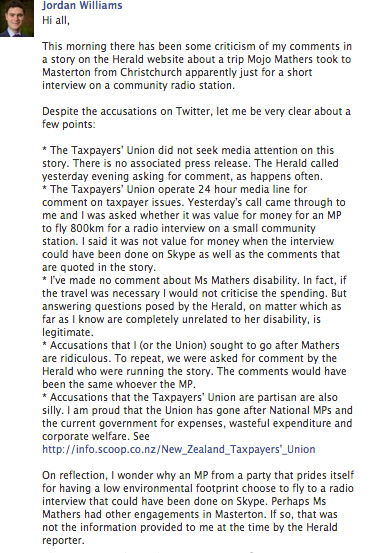 So the question must remain, if neither side is admitting tipping off the Herald, who did and why? Also, why Patrice Dougan? Why not a political reporter? Or is there more to this than meets the eye? 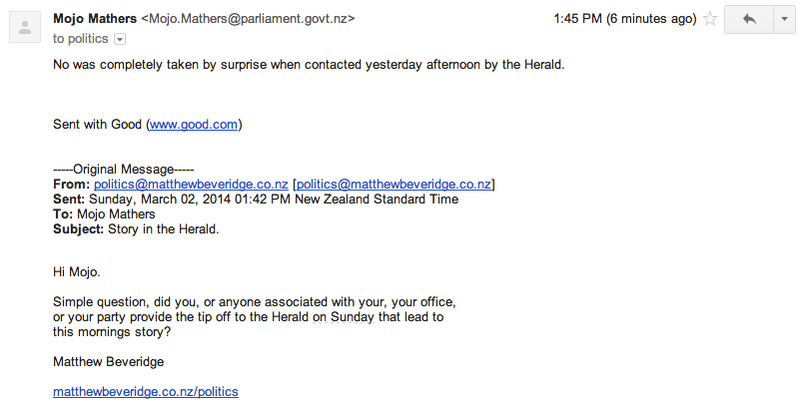 Have just spoken with Andrew Campbell, Green Party Communications Director, they did not tip off The Herald on Sunday. When they were contacted, the reporter already had information on the fact Mojo had traveled to the Wairarapa for the interview. The fact that Mojo retweeted a picture of herself in an interview could be the source. But it still does not explain why it has been run as a story. Command+Shift+3 is good to capture an entire screen, I find it quicker than using Grab. Link to Imperator Fish’s thoughts?